Fresh corn is good for us. It’s a high carb food, with good quantities of vitamins A and B, and some C. It contains potassium, moderate amounts of protein and hardly any fat, but as we know, it tastes so much better slathered in butter, or doused in freshly pressed olive oil. It also works a treat with avocado oil, and makes a mean salad as such spruced with lime juice, sea salt, fresh diced avocado, and any of the herbs mentioned, or basil. Kernels shaved off fresh raw cobs and simmered in a knob of butter and a good jot of single cream for several minutes, then flavoured with tarragon, is mighty fine served on toasted English muffins and garnished with crisp rashers of fried bacon, or as a hot vegetable alongside a French roast chicken. To cook cobs in their husks, remove the silks first. 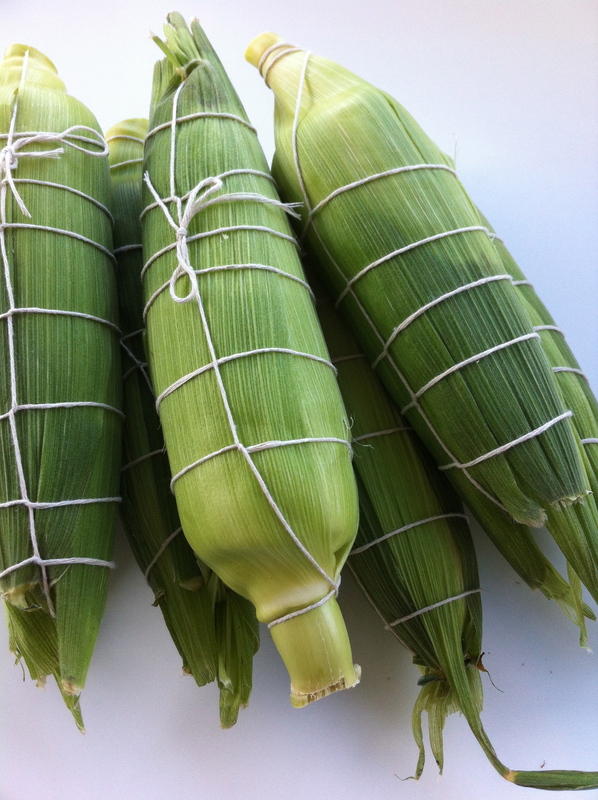 Pull down the husks leaf by leaf, remove silks, then rewrap cobs carefully; tie with string if necessary. Soak sweet corn in cold water for 15–30 minutes. Cook over hot coals for 15–30 minutes, turning often. The corn will steam and become tender. The moisture prevents burning but once the water has evaporated, the sugars will caramelise and develop a rich, sweet flavour. If you don’t have hot coals at your disposal, cook the sweet corn on a preheated, lightly oiled barbecue hot plate over medium heat. Splash the corn with cold water from time to time to create steam, and turn the cobs every few minutes. If the barbecue has a lid cook mostly with the lid down. Either way will take 25-35 minutes. Remove string and husks and sprinkle cooked corn with salt and serve with butter or extra virgin olive oil. While most of us enjoy eating corn on the cob, some people prefer it off the cob. That’s easily done; simply slice the cooked kernels off the cob with a sharp knife. Eat the kernels hot with dabs of melting butter and loads of salt and pepper or stuff them into generously buttered bread rolls; the warmth of the kernels melts the butter. Gorgeous. Bacon and avocado make it even better. Corn in the pan cooked in nothing but butter. Now there's a deliciousness too good to ignore.